It seems almost universally understood that sugar represents love. What are sweets if not foods that we give and enjoy as a reward or as a symbol of affection? To argue that sugar is toxic would be contrary to our intentions when we give candy to a child for being brave at the doctor’s office, when we offer a box of chocolates as a romantic gift or when we indulge in a donut after posting a podcast episode. It may be a bitter pill to swallow but the documentary Sugar Coated comes as much needed medicine considering how, as reported by the World Health Organization, worldwide obesity has doubled and diabetes rates have more than tripled over the last 30 years. 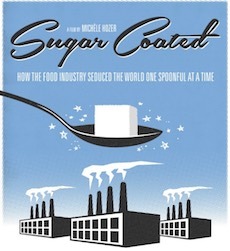 Directed by Michèle Hozer, the documentary argues that the manipulations of the food industry have left consumers exposed to unhealthy food choices. The experts in Sugar Coated say that eating sugar in moderation and getting regular exercise is not enough to balance out the calories. If it is unclear who the bad guys in this tale are, an incriminating document surfaces with “The Sugar Association” emblazoned on the letterhead. The film is not shy about drawing similarities between this situation of corporate profit motivation versus public health and the case against the tobacco industry. 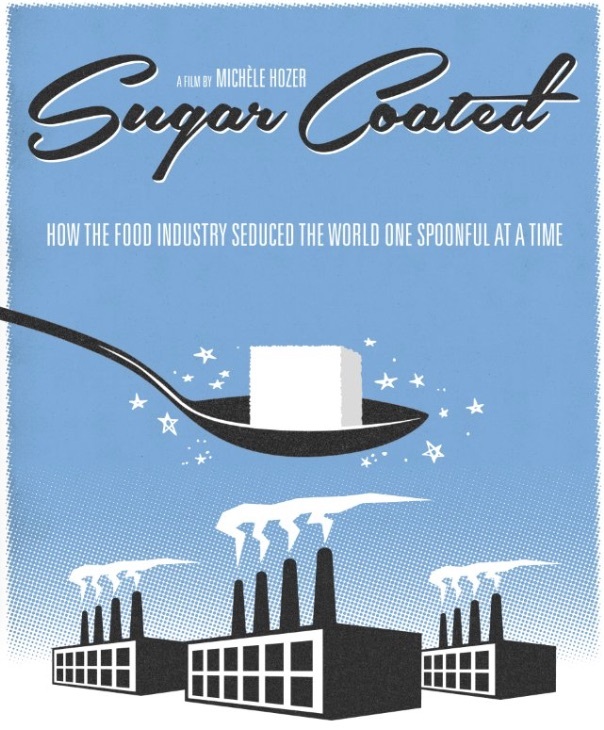 Sugar Coated does not have a battle of the moment to focus on, so the film plays more like a summary of the history of the debate surrounding sugar’s safety. The debate picked up steam in the 1960s when British physiologist and nutritionist John Yudkin began warning about the substance’s health consequences, only to be countered Ancel Keys. The American scientist argued the real problem was the amount of fat in one’s diet. What resulted was years of conflicting analyses of research. A quiet mystery is teased at one point with an odd photograph from that same period with Sugar Association executives proudly accepting a trophy. The background story of that photo was uncovered by Cristin Kearns, the Dental Director of a Denver health centre, after she began digging through archival documents that a defunct sugar factory had donated to the Colorado public library. As she explains in her research, a picture emerges of the decades long public relations campaign of the sugar industry and how they were continually able to shift the conversation away from the questionable safety of their product. The film also features prominent critics of the sugar industry like Dr. Robert Lustig, an American pediatric endocrinologist and author, whose lecturing style has been likened to a preacher. Another notable expert is Dr. Yoni Freedhoff, whose widely watched YouTube videos have positioned him as an outspoken opponent of “deceitful advertising.” The University of Ottawa assistant professor even challenged the Heart and Stroke Foundation on the value of their “Health Check” logo, which is meant to help food consumers find heart-healthy products but is also a money-raiser for the non-profit organization. That uneasy balance between corporate funding and independent advocacy is demonstrated when the film follows Freedhoff to a conference on obesity that is sponsored by McDonald’s and Coca-Cola. Several moments employ simple animation to help communicate some drier information. The animation is not stylistically unique—charts and highlighted texts and numbers—but it gets the job done. Another visual element with a more elusive meaning is the recurring scenes of crowds moving through public spaces worldwide, sometimes in slow motion. While aesthetically satisfying, those scenes feel a bit like interchangeable, generic filler material. Either that or they contain a subtle commentary about how we are all going about our routines like sheep ignoring a dire truth about our realities. Without the direct involvement of the sugar industry, this is a one-sided conversation. Still, there is no need to feel bad for the sugar industry since they have bought and paid for the debate on sugar consumption for decades. Returning to that photo of the executives receiving the trophy: it was an award for their public relations effort to convince the US Food and Drug Administration that sugar is safe. This documentary tries to dispel the corporate marketing smokescreen with facts, so maybe that is partly why it plays it so safe. The interview subjects voice their concerns about sugar consumption but they never say anything too alarming on camera. In a clip borrowed from “The Stephen Colbert Show,” the TV host asks Lustig why not say “sugar is Hitler?” That’s a question I wanted to ask the filmmakers. Optimism comes by way of examples of individuals deliberately changing their diets and at least one instance of government intervention. The “nanny state” approach of the latter example is taken from Japan and it may be too tough to sell to North Americans. Nevertheless, this documentary is wholly relevant today and will certainly give viewers some real food for thought rather than empty calories. Great article with excellent idea!Thank for such a valuable article. I really appreciate for this great information..